Sandhills grassland that was burned in a wildfire in 2012. Photo copyright Chris Helzer/The Nature Conservancy. The Nebraska Sandhills are often viewed as an ecosystem vulnerable to erosion of the sandy soil dunes following the reduction of aboveground vegetation. Vegetation is what maintains the stability of the sand dunes by binding the soil with roots and protecting the soil surface with aboveground plant mass. When vegetation is removed, the wind is free to move the sand particles, hindering vegetation recovery. The potential for this to occur is evident at a small-scale in the form of blowouts that act as a reminder of the long-term impacts of vegetation removal. Although improvements in range management practices have reduced the amount of bare sand, concerns remain over the vulnerability of the sandy soil to erosion after aboveground vegetation is disturbed. This belief is evident in federal land management frameworks, including the Ecological Site Description Database and the LANDFIRE Program, which depict the Sandhills transitioning from a stable grassland state following wildfire to a mobile sand dune state. As a result of these concerns, management of the Sandhills has sought to limit disturbances, such as fire, that greatly reducing aboveground biomass and expose bare ground. Contrary to land management frameworks and local concerns, Sandhills grassland burned in a wildfire during the 2012 extreme drought conditions recovered in two years to levels that were not different from adjacent areas that did not burn. We attribute this lack of soil mobilization to the root mass below ground that continued to bind the soil and provided necessary nutrients for aboveground regrowth. Our findings add to mounting evidence that short-term events such as fire, even in combination with drought, lack the ability to cause enough damage to plant roots necessary to trigger the destabilization of the sand dunes. Instead, long-term drivers such as mega-droughts (decade-long droughts) or overgrazing that reduced root mass are more likely to be associated with destabilization of the sandy soil. This research serves as a good reminder that Sandhills grassland, like other prairie ecosystems, have a long history of fire occurrences and are well-adept to recover rapidly following fires once rainfall alleviates drought and with appropriate stocking rates. Scientists in this study concluded that greater threats to the productivity of the Sandhills are on the horizon. The continued increase in Eastern redcedar in some areas has resulted in 75% loss of livestock revenue for landowners in multiple regions. Without major changes in management, the plant community shift following woody plant encroachment is permanent. In contrast, Sandhills grassland recovered within two years following wildfire during the most extreme drought on modern record. 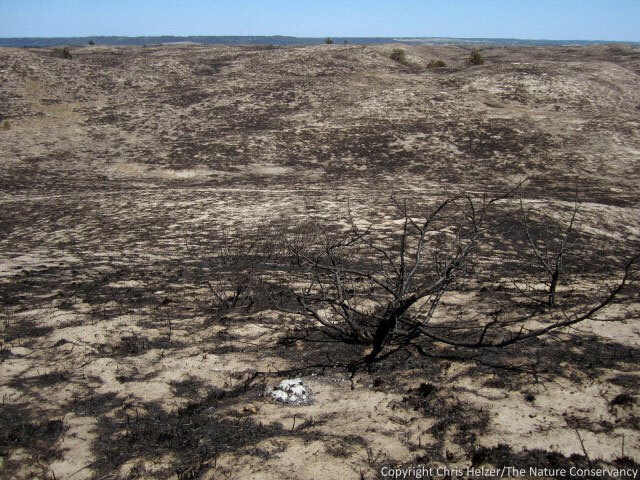 Read the original article “Resilience of Sandhills Grassland to Wildfire During Drought” here.